Once they’re called completely, layer on the frosting and your favorite decorations. Here I used nonpareils, pink sanding sugar and spring sprinkles. The more frosting the better, obviously, but remember that you’re going to be closing the lid, and you don’t want to ruin all that decoration. Here’s another hint about the timing of your gift: You’ll notice that the egg carton has holes in the lid. This is a good thing for eggs, but not so much for cupcakes. 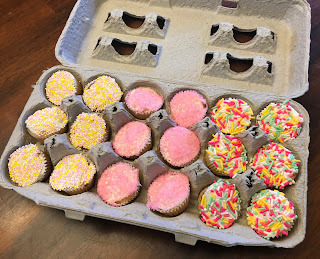 Either give the gift box immediately after decorating them or store the cupcakes in an air-tight container until the last minute. Otherwise they’ll dry out very quickly and not be nearly as tasty.